Analyses British Literature Broad Notes Plays Philosophy of Absurd in Albert Camus' "The Myth of Sisyphus"
Philosophy of Absurd in Albert Camus' "The Myth of Sisyphus"
 Humans exist in a physical form.  Death is a real thing and, although the definition is debatable, there is a distinction between life and death.  Humans have some sort of free will.  There is no god. Much of the beginning of the essay is spent framing up the existential condition which Camus calls the absurd. Man is caught in a paradox. On the one hand, all empirical evidence shows that the world is unpredictable and chaotic. Lives come into existence and pass. Ideas are proven to be true then determined to be false. One belief is held than another. Even our own moods are constantly shifting. On the other hand, man has a persistent nostalgia for unity, a need to make sense of the world. This is the human condition, Camus suggests, a constant attempt to derive meaning from meaninglessness. And it is absurd. Camus’s response to this condition of the absurd is to “live in revolt.” By this he means that we accept the tension of searching for meaning in a totally chaotic world. We deny neither our hunger for unity nor the apparent disorder of the world. The last part of the book is dedicated to examples from history and literature of people who have lived this life of revolt to varying degrees. Camus took this very question into account when he said “[t]here is but one truly serious philosophical problem, and that is suicide. Judging whether life is or is not worth living amounts to answering the fundamental question of philosophy”. This issue must come before all else because, if one wishes to live one’s philosophy, this will dictate whether or not one should commit suicide. Camus looks around at people dying by their own, or others hands when he says “I see many people die because they judge that life is not worth living. I see others paradoxically getting killed for the ideas or illusions that give them a reason for living (what is called a reason for living is also an excellent reason for dying)”, and thus Camus begins a journey. 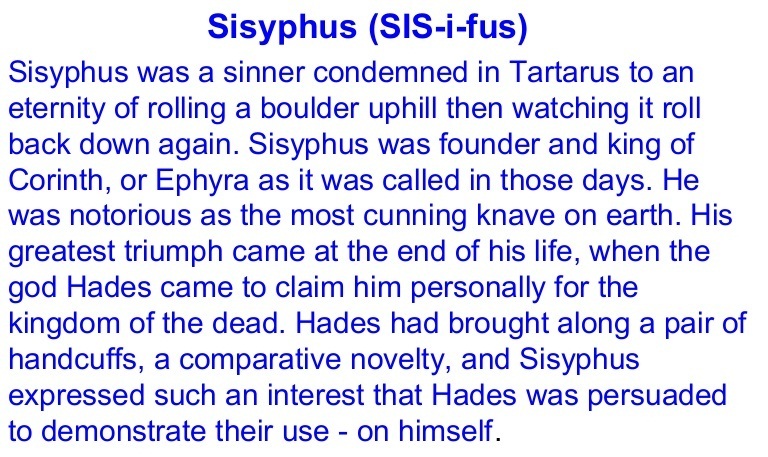 Camus provides a perfect analogy for man to live by, the story of Sisyphus. 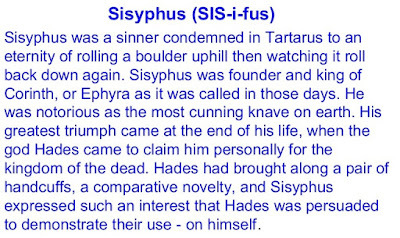 According to Greek mythology, Sisyphus was a king who was constantly being deceitful towards the gods (who didn’t take kindly to that). 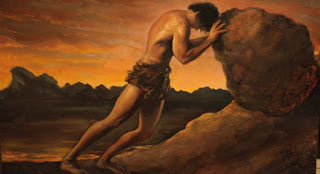 The gods punished him by forcing him to push a boulder up a hill just to see it roll back. He was then forced to repeat the action for eternity. In the end we are not completely compelled by Camus’s conclusions. His assertion that a philosophical life is a constant struggle rang true, but I was unable to understand the historical and literary examples he used to illustrate this “life in revolt” (this is probably due to my unfamiliarity with the philosophers and literary characters he used as examples). I did not see the horror in the "philosophical suicide" that he attributes to religious philosophers. I have worn out plenty of philosophies on life and will probably continue to plow through many more. I have seen that an intuition or experience can solve an existential dilemma as well as, or even better than, the clearest thinking. Maybe I am not a true philosopher, but the reasons I could come up with for avoiding suicide would be centered round my relationships, certain moments of inspiration, and a very strong, clear sense from my body that I will protect it at all costs.